The cell energy fraction that powered maintenance and expression of genes encoding pro-phage elements, pta-ack cluster, early sporulation, sugar ABC transporter periplasmic proteins, 6-phosphofructokinase, pyruvate kinase, and fructose-1,6-disphosphatase in acetogen Clostridium sp. MT871 was re-directed to power synthetic operon encoding isobutanol biosynthesis at the expense of these genes achieved via their elimination. Genome tailoring decreased cell duplication time by 7.0 ± 0.1 min (p < 0.05) compared to the parental strain, with intact genome and cell duplication time of 68 ± 1 min (p < 0.05). Clostridium sp. 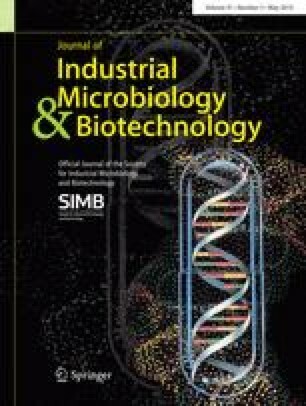 MT871 with tailored genome was UVC-mutated to withstand 6.1 % isobutanol in fermentation broth to prevent product inhibition in an engineered commercial biocatalyst producing 5 % (674.5 mM) isobutanol during two-step continuous fermentation of CO2/H2 gas blend. Biocatalyst Clostridium sp. MT871RG11IBR6 was engineered to express six copies of synthetic operon comprising optimized synthetic format dehydrogenase, pyruvate formate lyase, acetolactate synthase, acetohydroxyacid reductoisomerase, 2,3-dihydroxy-isovalerate dehydratase, branched-chain alpha-ketoacid decarboxylase gene, aldehyde dehydrogenase, and alcohol dehydrogenase, regaining cell duplication time of 68 ± 1 min (p < 0.05) for the parental strain. This is the first report on isobutanol production by an engineered acetogen biocatalyst suitable for commercial manufacturing of this chemical/fuel using continuous fermentation of CO2/H2 blend thus contributing to the reversal of global warming. The authors have made equal contribution to the reported project. The research was supported by the angel funds of MT family friends. Biocatalyst Gurus, Inc. is the sole distributor of the electroporation and electrofusion equipment, custom multi-fermentor modules and MT254UVnator: www.syngasbiofuelsenergy.com.